Eton College, in the south of England, has returned more than 450 antiquities to Egypt, after it was realised that many had probably been illegally exported. Last month we reported that the main part of the school’s collection, bequeathed to the school by Major William Myers in 1899, is going on long-term loan to Birmingham University in the UK and Baltimore’s Johns Hopkins University in the US (The Art Newspaper, May 2009, p7). Dr Reeves was worried to find that much of the Webb-Davey donation had been acquired in Egypt during the period 1972-88, and there was no surviving documentary evidence that proper export procedures had been followed. This was after the 1970 Unesco Convention on illicit trade in cultural property. The remaining Webb-Davey antiquities seem to have been purchased in good faith on the London market during the same period, but no information was available on how they had left Egypt. See the above page for more. See Dr Reeves's own statement on the subject here. Thanks to Vincent and his reader Todd for sharing photographs of an area adjacent to the pyramid of Menkaure at Giza where excavations of some sort are apparently underway with the aid of heavy machinery. See the above link for the photos. Thanks to the What's New In Papyrology blog for pointing me to the above review. In 1954 the Church historian Herbert Musurillo re-edited a collection of all known Acta Alexandrinorum (or Acts of the Alexandrian Martyrs), and since then there has long been a need for a new study taking into consideration the newly published fragments of this fascinating literature. Andrew Harker's book must thus be welcomed as an entirely appropriate and timely work that fills a major gap in scholarship. The author must be congratulated on that. After an Introduction, that distinguishes the "Acta Alexandrinorum proper" from an "Acta related literature", a literary genre that elaborated on older stories, Chapter 2 looks at the texts relating to the Alexandrian and Jewish embassies to Gaius and Claudius. Harker argues that the events of 38-41 led to the creation of the first Acta Alexandrinorum and provided a literary model which future writers of stories would follow. For Harker, the trial of Isidorus and Lampo, one of the most popular stories of the Acta, is to be set in 41 because it concerns the rights and status of the Alexandrian Jews, "an issue that Claudius dealt with in 41, and never, as far as we know, readdressed" (24). The Acta Isidori are regarded as literary products of the III. century, with some sections being originally written in the first century. All these texts, in Harker's view, were subject to manipulations by their authors, hence their numerous historical and chronological errors. According to Harker (25), the Letter of Claudius to the Alexandrians on papyrus (PLond 6.1912, CPJ 2. 153) is an anti-Jewish version of an official document, as it comes from the papers of a Hellenised Egyptian, a tax official of Philadelphia (Fayum) called Nemesion, who probably sympathised with the plight of the Alexandrian Greeks. Harker thinks that the obscurities of the Letter are due to the manipulations by the copyist. He also questions (26) the authenticity of the edict of Claudius quoted by Josephus (Jewish Antiquities 19.279-85), suggesting that Josephus was responding to an argument used against the Jews by the Alexandrian Greeks, that Augustus limited Jewish rights by ending the Jewish ethnarchy. Harker also attributes the fragment of a speech of an Alexandrian ambassador requesting the restoration of the Boule (CPJ 2.150) to the time of Claudius, and not to Augustus, as was orthodox to believe (29). I find all these observations entirely convincing. Florence, May 28 - Workmen inside Florence's courthouse have stumbled across a spiral column and hundreds of multicoloured fragments that experts believe may have belonged to a Roman temple dedicated to the Egyptian goddess Isis. Palchetti said the remains were ''comparable'' to others found over the last three centuries in the immediate area that have also been attributed to the temple of Isis, the Egyptian goddess of motherhood and fertility who was later adopted by the Greeks and Romans. When Libya opened to the West in 2003, it was widely hailed as a crucial first step by a “terrorist” regime coming in from the cold. But along with the legitimate companies vying to capture Libya’s lucrative markets, international antiquities-smuggling gangs were waiting for their chance to pilfer the country’s Roman ruins, which are some of the most pristine in the world. This trade, which first began in 1987 with the opening of the Egyptian border, has accelerated since 2003 with an unprecedented gutting of Libya’s ancient heritage sites underway since. “There’s been an explosion in looting all over the Mediterranean, but in North Africa it’s really becoming quite a problem,” said Gaetano Palumbo, the North Africa programme director for the World Monuments Fund, a New York-based organisation. Ancient ports, villas and entire Roman cities have been uncovered by western archaeologists after being buried under the Saharan sand for centuries. Farther inland, preserved Roman farming communities or semi-fortified towers wait to be discovered. The structures are inlaid with elaborate mosaics and covered with inscriptions, providing valuable insights into the everyday life of what was one of the Roman Empire’s wealthiest provinces. Libyan antiquities officials seek to downplay the extent of the looting, though they admit to a few spectacular heists such as the disappearance in 2000 of 15 statue heads from Cyrene, an ancient Greek city. But even these admissions gloss over the far more destructive daily ransacking of the sites by local crooks. One such small-time raider is Fathi Ismail, a local who operates inside Cyrene, a Ptolemaic site, selling the Hellenic coins he scavenges from the ground to tourists. His prices range from 10 to 50 dinars (Dh11-59) per coin, but he boasts that the “real money is in the heads of statues that lie buried below”. Often, digging out the ancient artefacts does not even require particular effort: rain storms wash away the topsoil, dislodging the ample treasures lying beneath. At other times, industrious badgers tunnelling underground eject them as they dig. An artefact’s journey from the Libyan sands to the gleaming auction rooms of Zurich and New York is like a trip up the human food chain which starts with the dirt-poor sand-scavengers in the south, such as Mr Ismail, and then on to the Egyptian gangs that smuggle the goods to Cairo and Alexandria, ending with the ultimate recipients – the wealthy and cultured in western Europe and North America who have a taste for collecting human heritage. Libyan officials will admit off the record that looting has severely damaged the spectacular and extensive Roman ruins spread across their country’s 2,000km-long Mediterranean coastline. But they shy away from direct criticism for fear of incurring their government’s wrath or of offending Egypt, Libya’s neighbour and ally. At the end of the COSI Columbus exhibit "Lost Egypt: Ancient Secrets, Modern Science," children might chatter about a 2,200-year-old human mummy or a tiny animal mummy. Kate Storm, director of experience development, hopes to see their interest in science piqued. "Research shows that girls, in particular, tend to stop being interested in science about middle school," said Storm, the leader of the team that produced "Lost Egypt." "One reason is, they view it as not being social. We really want to show it's like solving a huge puzzle." The exhibit sheds light on careers involved in scientific research -- from archaeologists and anthropologists to zoologists. The fruits of their labors, she said, are displayed in the show, which emphasizes laborers and artisans -- the common people who built the Pyramids. "Lost Egypt," to run Saturday through Sept. 7, was produced by COSI and built by the Science Museum of Minnesota. COSI needed about five years to assemble the project. Upon the opening of the 6,000-square-foot exhibit, visitors will experience several main areas: a mock field site that shows how scientists use aerial cameras and satellite imaging to pinpoint dig areas; a section with ancient Egyptian cultural artifacts, including the human mummy and other funereal objects; and a laboratory with X-ray and CT-scan machines, and rapid prototypes (three-dimensional physical models created from computer software) of ancient Egyptians. See the above link for the rest of the five page story. Thanks to Pierfranco Dotti for sending me the above link which discusses a technique for dating inorganic materials. I've been away for a few days but I understand that there is quite a lively discussion taking place on the subject over on EEF. Here's the abstract, but if you want the full article you can purchase it from the above address. 1. Author for correspondence (moira.wilson@manchester.ac.uk). Fired-clay materials such as brick, tile and ceramic artefacts are found widely in archaeological deposits. The slow progressive chemical recombination of ceramics with environmental moisture (rehydroxylation) provides the basis for archaeological dating. Rehydroxylation rates are described by a (time)1/4 power law. A ceramic sample may be dated by first heating it to determine its lifetime water mass gain, and then exposing it to water vapour to measure its mass gain rate and hence its individual rehydroxylation kinetic constant. The kinetic constant depends on temperature. Mean lifetime temperatures are estimated from historical meteorological data. Calculated ages of samples of established provenance from Roman to modern dates agree excellently with assigned (known) ages. This agreement shows that the power law holds precisely on millennial time scales. The power law exponent is accurately 1 4, consistent with the theory of fractional (anomalous) ‘single-file’ diffusion. This link was sent to me by Kelly Sonora, one of the organizers of the courses ,but I haven't actually gone into any of the courses so I have no idea what they are like. The one that is of most potential interest to visitors to this blog is one entitled The Ancient Mediterranean World. The segments that make up the course appear to be in the form of podcasts. With new technology making the world more interconnected every day, it can be beneficial no matter what field you work in to have a good idea of the history of not only your own country but those around the world. These open courses will help you to learn about history in diverse countries and time periods to give you a well rounded knowledge of the social, political and intellectual history that has shaped the modern world. When thinking of mummies, many think of a corpse covered in wrinkled, dirty old bandages, walking with outstretched hands and cursing death upon those who try to open a cursed treasure. This monster stereotype has gained popularity through decades of film depictions, but these myths were busted in Columbus last Thursday. The Columbus Museum of Art held the "Mummy Myth Busters," where museum employees discussed the truth about mummies. Curator of European art Dominique Vasseurand and educator for adult programs/film & AV specialist Jeff Sims hosted the event. Vasseur spoke about the historical aspect of mummies, while Sims discussed the film fictions that keep the mummy stereotype alive. Germany's main cultural organization expressed concern on Monday that Egypt's long-serving minister of culture could soon become the new head of UNESCO. "The election of Farouk Hosni as director-general of UNESCO would be a grave mistake," said Olaf Zimmermann, chief executive of the German Council of Culture. Hosni, who has been culture minister since 1987, has banned Israeli films from international film festivals in Cairo and declared that he "would burn Israeli books in Egyptian libraries" if he could. He is the main contender to succeed Japan's Koichiro Matsuura, who bows out as head of the UN Educational, Scientific and Cultural Organization later this year. The deadline for nominating candidates to succeed him expires at the end of May. The current database assembles all available Early Dynastic inscriptions, covering the first attestations of writing discovered in tomb U-j (Naqada IIIA1, ca. 3250 BC) until the earliest known continuous written text in the reign of Netjerikhet–more commonly known as Djoser (ca. 2700 BC). The database originated as a computerized Access document containing the collection of sources on which the author’s Ph.D. dissertation “A Palaeographic Study of Early Writing in Egypt” was based. The latter was kindly reformed into a web compatible application by Prof. Erhart Graefe, former head of the Department of Egyptology and Coptology at the Westfalische-Wilhelms Universität, Münster, Germany, which hosts the database. I wish to express my sincere gratitude to him. The database contains more then 4500 inscriptions. Each inscription was assigned a source number. The source list, published by J. Kahl in Das System der ägyptischen Hieroglyphenschrift in der 0.-3. Dynastie, 171-417, was the point of departure. The sequence of the Kahl list is chronological but this could not be followed when new sources were added as they were found. About 700 sources could be added to his collection starting with number 4000. Multiple impressions from the same cylinder seal were incorporated as one source since they are copies of one inscription. Summer's finally here and two of Columbus's most entertaining institutions of fun are kicking of the season with activities designed to invigorate the body and stimulate the mind. COSI looks to engage you by exploring the wonders of ancient Egypt through science and technology and, playing foil to the deadly heat and scorching sands of the ancient desert empire, the refreshing oasis of Zoombezi Bay is now open and ready to cool down your summer by quenching your thirst for excitement. Starting this upcoming weekend, COSI will be featuring a new exhibition entitled "Lost Egypt: Ancient Secret, Modern Science." Destined to become a big hit as a traveling exhibition, the COSI-conceived setup will premiere in Columbus before starting its trek around the country. Kate Storm is the COSI producer of the exhibit, which will focus not only on the science and technology employed in ancient Egypt, but that of the modern-day archeologists investigating those ancient techniques. "It's a 6,000 square [foot] traveling exhibition," says Storm. "It basically goes through the process of archaeology in modern Egypt, but looks at the ancient culture of Egypt." Thanks to Stan Parchin for sending me the above link. Can the message of the world’s vanished religions ever be understood? The urge to do so is irresistible when the art that they inspired dazzles us. “The Doors of Heaven,” and the important volume edited by the exhibition curator, Marc Etienne, purport to explain the “World Perceptions in Ancient Egypt,” as the subtitle puts it. But reconstructing theological concepts through the partly preserved texts of a dead language is not an easy task. And, more importantly, finding the secret of the illumination that we surmise here and there in the art of a faith that died out around the late third century A.D. seems beyond our reach. Yet, the investigation is gripping. Never mind the disappointing artistic selection, and the arid prose bristling with weird-sounding names and technical details required by the nature of the undertaking. More disturbing are its limitations, which the scholarly tone of the discourse cannot conceal. Deities central to the faith turn out, on closer inspection, to be deeply enigmatic. A relic preserved by state-of-the-art science almost 22 centuries ago is undergoing analysis by modern technology. And that analysis must confront not only the ravages of time, but also the damage done by “state-of-the-art” science in decades past. A blackened, shriveled body in white tissue paper, surrounded by gleaming white-painted metal and plastic. The body is ancient, and the surroundings as modern as they come. An Egyptian mummy dating back to the second century B.C.E. is being scanned by a laser on a table in the Hospital of the University of Pennsylvania. Time hasn’t been kind to the mummy, but scientists of earlier eras took their toll too. Samantha Cox is a junior anthropology major at Penn. Cox: The farther back in time you go, the more they were prone to kind of just taking them apart. She’ll analyze the mummies’ CT scans. Cox: I guess autopsies started happening more in the 50s, 60s, 70s, 80s they did them, but before that they weren’t even really looking for any kind of research data, they were just trying to see what was inside. They took them apart. Took out all the wrappings looking for amulets things like that they didn’t care about the bones or, the actual mummy part, they just cared what was in it, all the pretty things. The mummy on the table is called PUM II. That wasn’t his name; it’s the initials of the Pennsylvania University Museum, which is now the Penn Museum of Archaeology and Anthropology. The two signifies that this was the museum’s 2nd mummy to be given an autopsy… in 1973. That autopsy and accompanying x-rays yielded a treasure trove of scientific data about PUM II’s health before he died, somewhere around the year 170 B.C.E. For instance, parasites found in his small intestine revealed that sewage probably contaminated the soil along the banks of the river Nile where PUM II’s food was grown. But that autopsy left its marks. PUM II is missing a big rectangular chunk of his skull. It was removed in that 1973 autopsy. Modern technology lets researchers look inside without cutting. The CT scan surveys the patient with a laser, creating digital slices of images that create a 3-D composite of what the body looks like, from skin to bones and organs in between. Since the mummy joined the Wayne County Historical Museum collection nearly 80 years ago, children and adults have imagined the life of the person buried inside the sarcophagus. Was the mummy a man? A woman? Recent efforts have proven it to be a man, age 35 to 49, who was 5 feet 6 inches to 5-9. But what did he look like? The young and old can test their imaginations against the powers of forensic science when the reconstructed head of the mummy is unveiled Sunday. "To Live Forever...", a celebration of the reconstruction of the face of the Wayne County Historical Museum mummy, will begin with a mummy symposium at 1:30 p.m. Sunday followed by the unveiling and renaming ceremony at 4 p.m. Speakers during the symposium will include those who have done much of the work and research to bring new facts and a face to light. Egyptian gallery guest curator Bonnie Sampsell will trace the mummy's history, forensic artist Brenda Robertson Stewart will explain the evolution of the facial reconstruction and University of Indianapolis forensic anthropologist Andi Simmons will talk about what information the mummy's bones provide. Museum executive director Jim Harlan said he is eager to see the mummy's finished face. "The project started in 2006. I think we've gotten answers to almost every question we had about the mummy," Harlan said. "We wanted to speak with authority. I know the docents are eager to have the final information put together. It's all come together now in a real nice project." At the Shallalat Gardens next to the fortress of Mohamed Ali in Alexandria, a Greek archaeological mission has discovered what is thought may be a statue of Alexander the Great. The statue, of white marble, features an athletic man standing in an upright position. The right leg bent and the part of the left leg below the knee is missing. A 0.16m length of the right arm exists and it has a connection notch, while the left arm is completely missing. Inside the shoulder is a metallic connection. The phallus is broken but the testes are preserved. Kalliopi Limneou-Popakosta, director of the mission, said that the face was in very good condition except for some slight damage to the nose. The head is of the "heroic" type, with the characteristic turn of the neck and an upward glance of the eyes. The face is handled in the soft Praxitelian manner. The statue has curly hair with a ribbon, and there are sideburns on the cheeks. The body is slightly turned to the right in a "contraposto" style, and once possibly leant on a base, traces of which can be seen under the right buttock. FOLLOWING almost six decades in storage, for part of that time at the Central Bank of Egypt, a number of important pieces belonging to the Mohamed Ali family jewellery collection have been placed in the Egyptian Museum. Last week the museum in Tahrir Square was crowded with not only the usual visitors but also with museum staff carrying huge wooden boxes full of royal family jewels, which were confiscated at the time of the 1952 revolution. The objects will be classified and subjected to restoration before being put on special display. I do not understand what else I can do. All my life I have worked very hard and have always tried to do good things for my country and for antiquities. Before I became secretary-general of the Supreme Council of Antiquities, archaeology in Egypt was a bit like Raiders of the Lost Ark: there were no rules. Everyone was free to do anything they wanted. Everyone was in a position to announce their own discoveries, whether true or false. Since 2002, I have implemented a series of rules for archaeological expeditions to follow. Recently I read an article written in the New York Times that demonstrated to me how little some people understand what I do. I am not referring to the reporter who wrote the article, but more so about the Egyptian reporter who gathered people's opinions. This article indicated to me that I need to address some of the issues raised in it, and to share my point of view. There are always people who enjoy criticising everything, but they never offer any good solutions in return. I wouldn't have bothered with yet another Nefertiti story, but it is a slow news day and this is a coherent summary. For decades, people have marvelled at the bust of Nefertiti. Now, some scholars say it's a fake -- made to hold a necklace. Museum scientists are eager to prove these theories wrong, but the mysterious statue might not be ready to reveal her secrets yet. Of course they copied her. You can see it clear as day. At the Altes Museum on Berlin's Museum Island, a brief film runs in a silent loop on a monitor. It shows laboratory workers handling a replica of the Nefertiti bust built to test a new portable base for it. The monitor is part of a current display at the museum, one which includes four work stations set up in a large, glass cubicle to show just how complex conserving great works of ancient art is. Museum visitors can look over the shoulders of specialists to see how the secrets of these old artifacts are revealed using infrared spectroscopy, X-ray fluorescence and microscopy. The Nefertiti bust itself is only a few steps away. 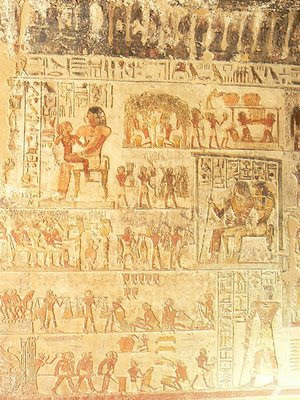 The piece, which bears inventory tag number 21300, is one of the most famous pieces of art from ancient Egypt. And in recent weeks, its authenticity has been the subject of much debate. A sign next to the lab workers reads "Questions Welcome." And Henri Stierlin, a Geneva-based author, certainly does have a few questions. Stierlin is interested in the Nefertiti copy, and he's not referring to the white model of the bust shown in the film flickering across the monitor. His suspicions run deeper. A quick note to let you know that I am away for the next few days but will be back on Wednesday. Cheers to All. Andie. Fragments of pottery with inscriptions in one of pre-Islamic languages have been found by a U.S-Polish team of archaeologists near Berenike, a Greco-Roman harbour on the Egyptian Red Sea coast. The finds confirm that Berenike was the most active Red Sea port during Hellenistic and Roman times. Inscriptions and other written materials found in Berenike have been written in 12 different languages. This attests to the cosmopolitan mix of people who lived in or passed through the town. Berenike was founded by Ptolemy II Philadelphus in 285-246 B.C. The international team of archaeologists led by professor Steven Sidebotham of the University of Delaware and Iwona Zych of the Warsaw University Mediterranean Archaeology Department have resumed excavation at Berenike after an eight-year break. 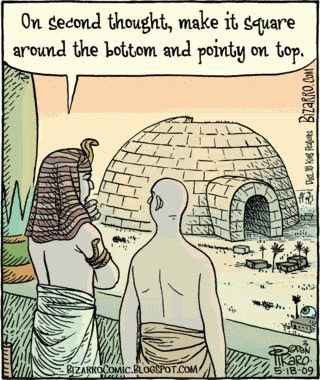 Vincent has posted an index to his series of articles about different theories as to how the pyramids were constructed - in six parts. Secretary General of the Supreme Council of Antiquities Dr. Zahi Hawwas announced yesterday 19-5-2009 on the sidelines of the Turin International Book Fair that Prime Minister Dr. Ahmed Nazif had agreed on the transfer of the Egyptian Sunken Antiquities Exhibition to a new tour in Japan and the US after the success it achieved in its European tour which included France, Germany, Spain and Italy. The Exhibition will leave the Italian city of Turin, heading for the Japanese city of Yokohama from June to September 2009. Hawwas added that this Exhibition is of top importance given that it is the first time in which these antiquities are displayed outside Egypt after remaining for thousands of years in the sea. The European tour of the Exhibition achieved revenues of $ 5 million after being on display in Berlin, Bonn, Paris, Madrid and Turin. The Exhibition comprises of 489 rare artifacts which were extracted off the Mediterranean in Alexandria. Today, we moved “Annie” our mummy to her new glass encased home where she will be on display through September 7, 2009. You could hear a pin drop as we rolled her down the hallway. See the above page for the 2 minute video. En la sede de la Fundación Tres Culturas de Sevilla, llego, el lunes 18 de mayo de 2009, Zahi Hawass, para la rueda de prensa previa al seminario de Cooperación Hispano-Egipcia. La muy poca asistencia de los medios de prensa regional y sobre todo nacional, hacían prever un pequeño fracaso en la repercusión mediática de este viaje histórico del Papa de la egiptología moderna. Sin embargo, el día siguiente, en la inauguración del seminario, celebrada en la Real Academia de bellas Artes, hubo un overbooking de aforo en la sala. Ahí el Doctor, con una elegancia vestimentaria muy notable, dio su conferencia en su particular inglés, que todos entienden, y mantuvo la asistencia entera fascinada, con su exposición de los últimos descubrimientos arqueológicos en Egipto. Gracias a numerosas diapositivas, pudimos ver y oír con su entusiasmo contagioso, un sinfín de sitios donde está actuando el Consejo Supremo de Antigüedades Egipcias. Volunteerism, a concept that has recently resurfaced despite it being rooted in many religions, remains alien to a lot of Egyptians, particularly those who inhabit the rural, marginalized areas of the country. In an attempt to spread this idea, 30 volunteers from across continents and ages took part in a two-week project designed to spread the spirit of volunteerism, mobilize members of a small community and encourage them to become active contributors to their society. Through carrying out a number of projects we were not only able to deliver that message, but we mobilized a group of five individuals who are starting up their own organization (they are now volunteering every Friday) and built a relationship with an entire community. Farafra is home to some 4,000 people. The mud brick houses, its narrow roads and the rarity of cars give it a unique character. There is one main road in Farafra, along which is situated the hospital, city council, library and a couple of schools. It was around September 2008 when I visited Farafra with the four other staff members of the IPP, the International People’s Project It wasn’t the first time for me in the oasis, however; I’ve been involved in Farafra since December 2006. During the September trip we met with members of the community, both formally and informally. We met with young, enthusiastic leaders, government officials as well as key figures. Along with a group of young Farafroni volunteers, we were able to draft our vision, set our goals and work out a plan. We decided three projects: small-scale construction, reviving a social center for the Farafroni women and planning mini-camps for the children. 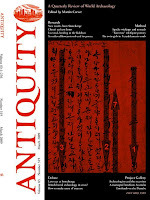 Antiquity invites the submission of high-quality archaeological photographs for publication in the journal. Two photographs will be selected and published each quarter. A judging panel will decide the best photograph published each year and a cash prize of £500 will be awarded to the winner. Photographs must be sent as digital images at a minimum width of 135mm @ 300 pixels per inch and a maximum height of 200mm. All photographs should be accompanied by a short caption providing details of the site/artefact, when the image was taken, where the image was taken from, what are the circumstances of the site/find, the date of the site/find and technical specifications of the image. Portrait orientated images are preferred. Terrific footage from inside and underneath the Step Pyramid of Djoser. Just over six minutes long. And not a hard hat in sight. Just south of Cairo, in an area known as Saqqara, there is something that has just been uncovered and a 24-Hour News 8 camera was the first to capture the images of what lies deep inside the Step Pyramid. Dating back 5,000 years, the oldest pyramid in Egypt is now frail and breaking down. Builders are laying in the concrete and putting in massive stones to restore the disintegrating pyramid. No heavy equipment is being used. The workers shape every new stone, use dollies, wheelbarrows and human strength -- not too different from centuries ago. They've been at it for a year under the direction of Dr. Zahi Hawass. While his job is Egypt's Secretary General of Antiquities, Hawass now feels like a doctor with a patient on life support. The pyramid's unique design is a result of a change in plan. What started as a flat roof, two-level tribute to the Pharoh Djoser, became the largest structure in existence after its estimated 20-year construction. It reaches more than 200 feet high, but the burial chamber lies 100 feet below the sand and rock and that's just where a 24-Hour News 8 crew went. See the findings by clicking on the Video tab in the left margin of this story. There's more video of the Step Pyramid at Hawass's own site. On Wednesday 13 May the Society hosted a fascinating lecture by Joost Hagen, a doctoral student at Leiden University in The Netherlands, on ‘A dossier of one Arabic and four Coptic letters found at Qasr Ibrim (AD 758-60)’. This group of five letters from the eighth century AD were excavated by the Egypt Exploration Society at Qasr Ibrim in 1972. One, from the Abbasid governor of Muslim Egypt to the Christian king of Makuria and Nobadia, is written in Arabic and has been published and commented on several times; the others, written in Coptic, have only been discussed briefly. The speaker’s doctoral research has led to a reassessment of the purpose of the Coptic letters and the question of their writer and addressee. The complete dossier sheds light on the political, economic and religious contacts between Christian Nubia and Muslim Egypt, and the problems both had with the nomadic tribe called the Blemmyes or Beja. Mr Hagen has been preparing the publication of Coptic manuscripts discovered by the Society at Qasr Ibrim, and has recently made a most interesting discovery, indentifying some fragments as having come from the Second book of Enoch, a pseudepigraphic of the Old Testament. This is the first time an example of a non-Slavonic manuscript of this intriguing text has been found. The fragments, found in 1972, are four in number, and probably represent the remnants of four consecutive leaves of a parchment codex. A fascinating selection of human and animal mummies is to go on public show for the first time ever as part of an upcoming exhibition in this northern Italian town. The bulk of the exhibition will focus on items kept in storage at Turin's Egyptian Museum, the largest collection of Egyptian artefacts outside Cairo. There are two human mummies on show, one male and one female, dating back to the First Intermediate Period (2,100-1,900 BC). The unknown male mummy is encased in a sarcophagus and holding a staff, a symbol of power and prestige. The female mummy is of a woman named Neb-em-Khis, the wife of a provincial chief, whose powers typically grew as the pharaoh's waned. Neb-em-Khis's sarcophagus contained a mirror, a headrest and a makeup box, all of which will go on display with the mummy. Although in good condition, the mummies have been the subject of a careful study and conservation process in recent months. 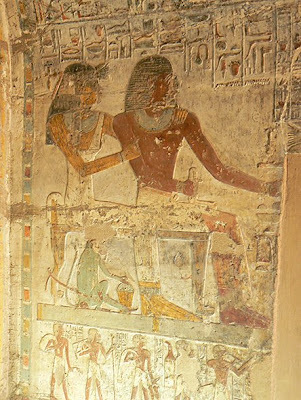 The sarcophagi were discovered in Egypt in the early 1900s during excavations carried out in Assiut and Gebelein by the renowned Italian Egyptologist, Ernesto Schiaparell, famous for finding the tombs of Queen Nefertari and the royal architect Kha. Also on display will be a series of excavation diaries, letters and photographs by Schiaparelli documenting the digs and his excitement at discoveries during the period 1908 and 1920. Thanks to Rhio Barnhart for this link. A slump in tourism is aggravating Egypt's economic woes and affecting the lives of those who depend on the industry for a living. About 20 percent of Egypt's foreign currency earnings come from tourism. In 2008, almost 13 million foreign tourists visited Egypt, taking in its pharaonic and Islamic sites along the River Nile. But now, the drop in revenue is hitting the country hard. Empty tour boats line the River Nile, as boat captains desperately solicit passengers from the meager crowd of tourists strolling along the riverfront walkway in downtown Cairo. The global economic crisis, which began last year, is causing a serious slump in the tourism industry. Tourism is a main source foreign currency earnings, along with revenue from the Suez Canal and remittances from Egyptian workers abroad. Paul, a tourist from Manchester, England, says the global crisis, as well as a vague threat of terrorism, is making tourists like him think twice before traveling abroad. "We're only getting eight Egyptian pounds to the English pound; last year it was 10," he noted. "And I think the credit crunch is really biting, plus the terrorism threat, as well." The discovery of the burial chamber revealed something of a labyrinth, at a depth of 12 meters and hidden behind a maze of halls and pits covered with earth and stones. José Manuel Galán says that the chamber is like an open book of history, providing knowledge about the lives, beliefs and religious ritesas well as details of everyday life at the time. Thanks to these drawings, he says we now know more about the internal politics of the female pharaoh Hatshepsut and the development of Egypt under her reign. Although no sarcophagus was located the team found various grave goods including seven gold pendants which belonged to a family member. El descubrimiento de la cámara mortuoria fue, en palabras del investigador del CSIC, un tanto «laberíntico», pues ésta se hallaba a 12 metros de profundidad, escondida detrás de una maraña de salas y pozos cubiertos de tierra y piedras. Pero la insistente búsqueda mereció la pena. «Su cámara es como un libro de Historia abierto; ahora conocemos todo sobre su vida, sus creencias o sus ritos religiosos. También están inscritos en ella detalles de la vida cotidiana de la época. Gracias a esos dibujos -añade- hoy sabemos algo más sobre la política interior de la Reina Hat-shepsut y la construcción del Imperio». Y aunque el grupo de arqueólogos no halló el sarcófago de Djehuty -«su tumba fue reutilizada», afirma José Manuel Galán-, sí encontraron varios objetos del ajuar y siete pendientes de oro que «pertenecieron a alguna familiar». An account of a trip to Siwa, with lots of photographs (some just show people standing in front of things, on things and running around things, but there are also some great shots of archaeological sites, scenery and sunsets). We left for Marsa Matruh from Turgoman Station around 9:45pm on Thursday night, but of course Egyptian inefficiency had to come into effect here. The bus made a stop in Giza to pick up two passengers, so we didn't actually leave Cairo until past eleven. We arrived in Marsa Matruh around 4am. Matruh is the largest Egyptian city west of Alexandria along the Mediterranean Sea coast. I didn't get to see much of it since it was early morning, but it looked to be a bustling, clean, and interesting city. When we got to the bus station in Matruh, we realized the bus to Siwa didn't leave until 8am. We were very cold and not too keen on waiting around for four hours, so we accepted a taxi driver's offer to take us to Siwa for 200 LE. I don't remember much of the ride to Siwa since I was asleep, but our driver was pretty annoying. During the three hour drive, he smoked an entire pack of cigarettes, had several cups of tea, blasted "habibi" Arabic pop, and kept the window open the whole way to keep him awake. The road from Matruh to Siwa is nothing but desert, and with the window open, it was extremely cold. When we arrived in Siwa, the driver brought us to a bunch of different hotels to help us find a place. We were really sick of him so we just paid him his money (along with another 50LE he requested) and had him leave. 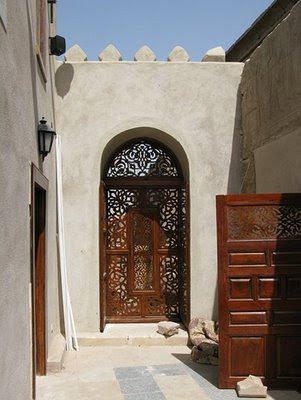 We checked into a hotel along the main square in Siwa called Al-Kilaani. The price was 120 LE for a two-person room. It was very clean, and included breakfast and air conditioning, so it was worth the price. The management spoke a little English. I've now used all of Tony Marson's excellent photographs, but fear not! Rescue has come from two sources. Thanks very much to Bob for sending me a massive new batch of photos to use on the blog. I've had a quick flick through and they are a super collection. Thanks also to Rick Menges who sent me a fine set from the Met and Brooklyn Museums in New York. I'm kicking off with a series of photographs from the Abu al-Haggag Mosque which is familiar to most visitors to Luxor as the mosque built into the side of Luxor Temple. The mosque can now be reached from the road side. 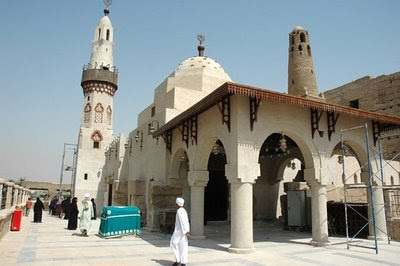 It attracted quite a lot of publicity in 2007 when part of the Pharaonic temple was revealed behind part of the mosque - there's a summary of the find (dating to Ramesses II) on the National Geographic website. The temple of Taposiris Magna, founded about 2,200 years ago during the reign of Ptolemy IV lies about 50 kilometers west of the city of Alexandria. The joint Egyptian-Dominican mission has been working here for about three years.Excavations outside the temple have recently revealed a large cemetery dating to the Greco-Roman period, and a radar survey of the temple itself has identified three spots of interest, where a burial chamber might lie deep underground. Zahi Hawass and Kathleen Martinez believe that these signs indicate that the temple may be the site of the long-sought tomb of the great queen Cleopatra and her consort Mark Antony. Join Hawass as he takes you inside the temple, introducing the latest discoveries and sharing his ideas about this great archaeological mystery. 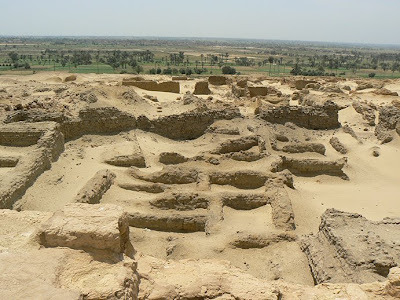 Thanks to Philippe Marti for sending me the above link for the new website of the Swiss Archaeological Mission in Sudan. It is available in French and English. Still today, Nubia is synonymous with a mysterious and faraway land through which the River Nile runs, a land that leads the way into Sub-Saharan Africa, its riches and its exoticism. While without writing for millennia, Nubian civilisation displays remarkable dynamism and originality, culturally as well as economically. 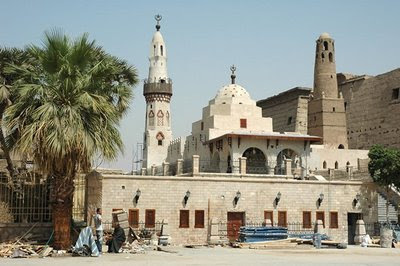 Kerma is one of the most important sites of the Nile Valley. Under excavation by a Swiss team for more than thirty years, it has revealed exceptional archaeological remains, monumental temples and vast necropoleis buried in the ruins of ancient cities. Kerma is the capital city of the first kingdom of Nubia. The region, which includes the oldest cemeteries of the African continent, also boasts the discovery of statues of the Black Pharaohs. The results of the 256-slice CT scans far exceeded our expectations, and to date this mummy may have been studied more exhaustively with CT than any other (see Figure 3). Although numerous books, journal articles, reports, and news articles discuss CT scanning of mummies, no comparable examination exists in terms of the details found, number of images generated, technical specifications of the imaging system, and computer-graphics results (see Figure 4). There are several unusual aspects to this study. Most important, all experts who worked on this project agreed to freely share all data obtained, which will be made available online (see Figure 5). To those who do not have access to a 256-channel CT scanner and unopened mummy in a casket, this therefore offers a unique opportunity to continue and expand our studies. See the above page for the full story with some excellent photographs. Thanks to Amigos de la Egiptologia for highlighting this story. Hawass is participating in a seminaar about Egyptology in Seville in Spain, and has taken the opportunity of a press conference to make various points. First, he has asked the Berlin museum that currently holds the Nefertiti bust to explain how it was taken out of Egypt in 1913. He says that if Berlin can prove the legality of the removal of the bust Egypt will not ask for its return. He added that the bust is certainly authentic and denied stories of it being a fake. He has also said that the results of DNA tests on mummies in Egypt will be released soon. He is hoping that results may help to determine the cause of death of Tutankhamun, the identity of his parents and which of the mummies is that of Nerfertiti. It is also hoped that studies will also reveal information about aristocratic female mummies whose identities are unkown at present. Finally, it is possible that the exhibition currently showing in Cairo, which highlights co-operation between Spain and Egypt, will eventually travel to Spain. El secretario general del Consejo Supremo de Antigüedades de Egipto, Zahi Hawass, que hoy participa en un seminario sobre Egiptología en Sevilla, ha pedido al Museo de Berlín que explique cómo salió el busto de Nerfertiti de Egipto en 1913 y si se contó con autorización egipcia. En conferencia de prensa, Hawass se refirió a este asunto asegurando que "si el busto de Nefertiti salió de Egipto de forma legal, no pediremos que vuelva", y añadió que hace tres meses envió una carta al Museo de Berlín pidiendo estas explicaciones. El arqueólogo egipcio, considerado uno de los más importantes e influyentes del mundo, aseguró que el busto de Nefertiti es auténtico y negó cualquier teoría sobre la falsedad de esta obra de hace 3.300 años, considerada la Mona Lisa de la antigüedad. "Una prueba de que pudo salir sin permiso es que cuando fue restaurado y limpiado, las autoridades egipcias pidieron a Hitler que lo devolviera y Hitler estuvo de acuerdo, pero cuando lo vio se enamoró de él y ya no lo devolvió", añadió el arqueólogo. Hawass emplazó al mundo de la cultura al 3 de agosto, cuando, en conferencia de prensa, tiene previsto dar a conocer las conclusiones de los estudios de ADN efectuados a varias momias, que podrán determinar las causas de la muerte de Tutankamon, quiénes fueron sus padres y cuál es la momia de Nerfertiti, entre otras aclaraciones. The ancient port of Adulis holds a phenomenal amount of information about the trade system of this part of the ancient world between 500 BC and 700 AD as well as important insights into the economy of the littoral and highlands of Eritrea. Adulis exerted great influence over the cultural area of the Southern Red Sea in the spheres of architecture town planning and landscaping. The site of Adulis is particularly relevant to a better understanding of the development of the Red Sea interchange circuit since 2nd millennium BC and the problem of the location of the Land of Punt, from which the Egyptians imported frankincense, gold, ebony etc. As a harbor, it was connecting the hinterland with ancient Egypt, Roman, Greek empires and China through the Red Sea. As documented in the Periplus of the Erythraean Sea, an ancient guide of the Red Sea and the Indian Ocean, commodities imported into this port were a variety of important materials including, unfurled cloths, arsinoitic robes, cloaks, linen, cooking pots, wine and garments, fabrics and glassware among others. The COSI team are shown unpacking artifacts from the Brooklyn Museum as well as the coffin and mummy from the Philadelphia Academy of Natural Sciences. Now, a veil of secrecy is descending upon the 130 priceless Egyptian antiquities that constituted "Tutankhamun and the Golden Age of the Pharaohs" at the Dallas Museum of Art. Event organizers don't want anyone to know exactly how the objects get disassembled, packed and moved to their next stop in San Francisco. A team of Egyptians from the Supreme Council of Antiquities in Cairo flew into Dallas on Sunday – the last day of the exhibit – and will begin the painstaking work this morning. The Egyptian government, which owns the artifacts, will not allow outsiders to photograph or witness the disassembly process. Details of how they are transported also are held close to the vest. "It's not a cavalier kind of process," said Mark Lach, senior vice president of Arts and Exhibitions International, the company that teamed up with Egypt to present the American tour of the Tut exhibit. "It's very precise and very delicate." The disassembly and packing could last 10 days to two weeks. "The pace moves as the safety and security of the objects dictates," Lach said. The Egyptian team – five or six experts with "very educated hands," Lach said – begins by removing the artifacts from display cases in 11 museum galleries. They know exactly how to handle each piece and carefully place it upon a table in an "artifact room" set up at the museum. After all, these things are more than 3,000 years old. Wielding magnifying glasses underneath special lighting, the team will compile a "condition report" for each object – such as royal jewelry, statuary and a stone coffinette that contained Tut's internal organs. They will compare the artifacts' condition with photographs taken before the exhibit installation in Dallas. 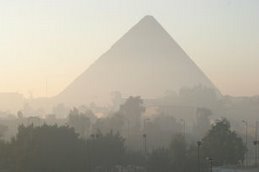 July 26 will mark the uncovering of one of the biggest secrets of the Great Pyramid of Khufu in Giza, Secretary General of the Egyptian Supreme Council of Antiquities Zahi Hawwas said Saturday 16/5/2009. Addressing a symposium held within the framework of the Turin International Book Fair, he said the SCA will undertake another experiment involving getting a robot made by a group of scientists at the Universities of Hong Kong and Manchester into the pyramid to uncover the mystery shrouding the third gate of one of the pyramid's corridors. This gate is expected to lead to the room where King Khufu is buried. The Great Pyramid of Giza (Pyramid of Cheops) is the oldest and largest of the three Giza pyramids and is the only remaining member of the Seven Wonders of the Ancient World. It is believed the pyramid was built as a tomb for Fourth dynasty Egyptian King Khufu (Cheops in Greek) and constructed over a 20 year period concluding around 2560 BC. The Great Pyramid was the tallest man-made structure in the world for over 3,800 years. Originally the Great Pyramid was covered by casing stones that formed a smooth outer surface, and what is seen today is the underlying core structure. Some of the casing stones that once covered the structure can still be seen around the base. There have been varying scientific and alternative theories regarding the Great Pyramid's construction techniques. Most accepted construction theories are based on the idea that it was built by moving huge stones from a quarry and dragging and lifting them into place. There are three known chambers inside the Great Pyramid. The lowest chamber is cut into the bedrock upon which the pyramid was built and was unfinished. The so-called Queen's Chamber and King's Chamber are higher up within the pyramid structure. The Great Pyramid of Giza is the main part of a complex setting of buildings that included two mortuary temples in honor of Khufu; one close to the pyramid and one near the Nile. Scholia Reviews ns 18 (2009) 8. Kasia Szpakowska, Daily Life in Ancient Egypt: Recreating Lahun: Blackwell Publishing, 2008. Kasia Szpakowska's book recreates the everyday life of the middle-class villagers of Hetep-Senusret -- now Lahun -- during the Late Middle Kingdom. Her approach intends to build up a picture of Egypt not as a monolithic, static culture (p. 8) but as a dynamic and lively society. Pursuing this, the narrative focuses on the experience of a young Egyptian girl Hedjerit and her gradual assimilation of the cultural values, beliefs, and practices of the Twelfth Dynasty. Right from the preface, the author explains that all the names used for the characters are actual names evidenced in Lahun. In the same way, Hedjerit's words at the beginning of every chapter reproduce the style of authentic Egyptian texts. The work begins with an explanatory chapter that informs the reader about the setting of Lahun. With interesting data about the homes and the village animals, it describes the historical, geographical, and social context of Hedjerit's background. In Chapter 2, Birth (pp. 23-44), the author considers the delivery process using Hedjerit as a model. Although childbirth is not documented in detail, she complements the subject with ethnographic evidence that allows her to draw some reasonable conclusions (for example, the use of the squatting position). Child protection, infant, and maternal mortality, post-partum problems, and family size are also questions examined within this chapter. Chapter 3, Close to Home (pp. 45-63), offers a comprehensive vision of the small daily world of a child on the basis that Ancient Egypt was a society that did not ignore its children, but acknowledged them as active and dynamic members of society. Scholia Reviews ns 18 (2009) 5. John Bodel and Saul M. Olyan (edd. ), Household and Family Religion in Antiquity. The Ancient World: Comparative Histories. Blackwell Publishing, 2008. Bodel and Olyan have succeeded in cobbling together a work that is fraught with problems and contradictions. This is due in no small part to the fact that, as the title of the book suggests, the object of their study is Household and Family Religion in Antiquity. The second half of their title provokes immediate uncertainty, with the word "Antiquity" loosely defining both the temporal and spatial parameters of the project, and thus shaping an extremely large area of inquiry with the broad notion of family religion as its only guide. [] Indeed, definition is pointed to as a key concern throughout this book's fifteen chapters, specifically the definition of the concept of family religion itself, and this is a problem that every contributor grapples with for at least a portion of his or her allotted space. While this does make the point that family religion appears to be entirely mutable and is often moulded to its context, I do still feel that even a modicum of direction on the part of the editors (perhaps in the shape of a basic and general definition with which the individual contributors could wrestle) would have gone a long way toward establishing a more directed discussion from the contributing authors and perhaps even have created the possibility of more useful conclusions. I would have to identify this lack of worthwhile conclusions (not all of the book's papers suffer from this malady) and the aforementioned extensive scope of the work as being its major downfall. I should however note that the temporal and physical realm this book seeks to explore is also an asset, as it does provide readers with an inkling of just how multifaceted and rich in complexities the subject of family religion is. Despite its problems I would still tend to recommend the book as a worthy addition to the field of ancient religious studies and a good read for those interested in the subject. See the above page for the entire chapter by chapter review. A summary of some of the work being carried out in Egypt by two Spanish teams in Aswan and Luxor. With photographs. Dos científicos andaluces, Alejandro Jimenez Serrano de la Universidad de Jaen y Myriam Seco Álvarez de la Universidad de Sevilla, se encuentran en Egipto realizando diversos proyectos de conservación de la Tumba QH 33 y de excavación en el templo de Tutmosis, respectivamente. Sevilla Actualidad. En medio del desierto africano surge una de las civilizaciones más espléndidas de la historia, la egipcia. Logró sobrevivir durante 30 siglos que dieron como fruto su escritura, calendario, la medicina y obras arquitectónicas que hoy continúan desafiando el inexorable rigor del tiempo. Dado el legado artístico de esta etapa, con ejemplos como las pirámides, las momias, los reyes-dioses, entre otras muchas obras, son numerosos los arqueólogos de todos los lugares del mundo los que han estudiado y estudian las huellas de esa herencia histórica en el actual Egipto pero a pesar de ello aún queda mucho por saber de la cultura egipcia. En estos momentos dos arqueólogos andaluces desarrollan excavaciones en Egipto, Alejandro Jiménez Serrano, investigador de la Universidad de Jaén que está realizando un proyecto de conservación y puesta en valor de la Tumba QH 33, situada en la necrópolis Qubbet el-Hawa, en Asuán; y Myriam Seco Álvarez de la Universidad de Sevilla, que dirige la excavación del templo funerario de Tutmosis III en Luxor. 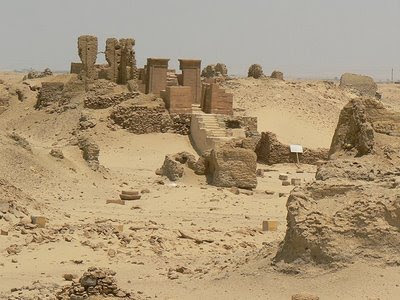 La necrópolis de Qubbet el-Hawa es una de las más importantes de Egipto ya que allí se enterraban a los nobles que controlaban la frontera Sur del país. Además, esta necrópolis no sólo es importante desde el punto de vista monumental; también lo es desde el punto de vista histórico, ya que contiene inscripciones que han facilitado las reconstrucciones de la situación geopolítica de algunas épocas. Taxpayers spend untold millions to subsidize the Dallas Museum of Art. But the museum says they have no right to know what kind of deal it cut with the for-profit organizers of the "Tutankhamun and the Golden Age of the Pharaohs" exhibit. The Dallas Morning News formally requested a copy of the Tut contract in January, citing a state law that requires most nonprofit organizations to make their financial records public. Museum lawyer Gary Powell said the DMA would not comply because it promised exhibit organizers absolute confidentiality. The secrecy is such that the museum won't discuss basic contract terms and can't even say how many people saw the exhibit for free, the lawyer said. The DMA said it does not compile statistics on ticket sales or average price per ticket; that's under the organizers' control. Powell also asserted that the state law on nonprofit groups applies only to those with "a specific problem – lack of accountability." The museum, he added, was not such an organization. "The DMA's Board of Trustees provides a very appropriate and vigorous oversight of the DMA's actions and ensures that the revenues and donations the DMA receives are used wisely and appropriately," Powell wrote in a letter to The News. Tom Kelley, a spokesman for the Texas attorney general's office, rejected the museum's legal interpretation. Rachel Weisz and director Alejandro Amenabar traveled back to ancient times to tell a modern story about a progressive woman standing against religious dogma and persecution. Amenabar's historical epic "Agora" premiered Sunday at the Cannes Film Festival, introducing audiences to the little-known scholar Hypatia, a brilliant astronomer and mathematician working in a man's world in 4th century A.D. Egypt. As the Roman Empire declines, Hypatia struggles to preserve scientific knowledge amid the clash of zealots in Alexandria, whose rising Christian population grows increasingly militant toward Jews and worshippers of the Egyptian gods. ruined town, with views out over the green expanses of the Faiyum. I have some very happy memories of Karanis. Su Bayfield has a great summary of Karanis on her Egyptian Monuments website. described on the UCLA/RUG website. Thanks very much to Carole Bass for sending me this link. As far as I can tell Braverman hasn't added anything that he hasn't already said in previous papers but I haven't read the paper that ths report describes. The original paper appeared in The Annals of Internal Medicine, Vol 150, Issue 8. If you are interested in reading it, it is available for purchase on their website. If you want to see previous posts on Braverman's research just type "Braverman" into the blog's search engine. Akhenaten, who ruled Egypt from around 1353 BCE to 1336 BCE, was married to the legendary beauty Nefertiti. But Akhenaten himself "was definitely a funny-looking pharaoh," says Irwin M. Braverman, a Yale dermatologist whose avocation is applying medical analysis to art history. In every known portrait, "he's depicted as having breasts, a lantern jaw, and an oddly elongated head." Some Egyptologists have theorized that Akhenaten's unusually androgynous features are metaphorical, symbolizing his belief that he embodied the creator deity. But in general, Egyptian art was more naturalistic in Akhenaten's time than at other periods. And the more Braverman studied images of the pharaoh, his son and daughters, and earlier members of the 18th Dynasty, the more he became convinced they were accurate portraits of people who shared an obscure genetic abnormality. In the April 21 Annals of Internal Medicine, Braverman and his colleagues argue that the unusual breast and hip development in these 18th Dynasty men and young girls is best explained by aromatase excess syndrome -- a genetic abnormality that results in too much estrogen in the body. (It could also account for the pharaoh's voice, described as beautiful and feminine.) Braverman attributes the elongation of Akhenaten's and his relatives' heads to a second genetic defect. The reinstallation of the Islamic art galleries at the Brooklyn Museum includes works from the 8th Century to modern times. Opening June 5, 2009, the permanent display at the Islamic galleries highlights 134 objects from some 1,700 in an American collection considered top-notch by art historians. Twenty works have never before or rarely been seen by the public. Especially strong in later Iranian art, the Brooklyn Museum's Islamic holdings come from North Africa, the Middle East, Central and Southeast Asia. On view are illustrated and illuminated manuscripts, calligraphies, drawings, oil paintings, ceramics, glass, metal- and woodwork, carpets, costumes, textiles, jewelry and architectural elements. This year's symposium is entitled "Egypt in the age of the pyramids: new research in the Memphite area". Cost £35/£25. As in previous years, the Glanville Lecture for 2009 will be preceded by a series of talks on related subjects. A FEW PLACES STILL REMAIN. The Symposium will be followed at 5 pm by this year's Glanville Lecture by Dr Jaromir Malek (Oxford) entitled "A city on the move: Egypt's capital in the Old Kingdom". After the Lecture there will be a reception at the Fitzwilliam Museum. The Lecture and reception are free of charge. Perhaps you, like me, tend to put these things off. It's actually quite pleasant to be a person who's often just as happy to stay home and read a book, but it means I never get around to seeing a lot of movies and festivals and lectures and fireworks displays. But I like a good, mainstream, popular upper-middle-brow blockbuster museum show as much as anybody. I made my husband take me all the way to Memphis to look at a Titanic retrospective long before the movie turned the epic disaster into a sappy romance for teenagers. Yet the deadline for Tutankhamun and the Golden Age of the Pharaohs at the Dallas Museum of Art crept up on me – it's over on Sunday. Anxious to avoid the crowds, I went on Wednesday. I did not avoid the crowds. Instead, I stood in a painfully long and slow-moving line, (all the signs called it a "queue," as if using the Euro-English term took the sting out) reading my trusty Kindle and trying to block out the shrill cacophony of field-tripping children being disgorged by school buses. And, let me tell you right now, that if you too have put this off until the last minute, and you're looking for excuses to let this one slip by – it'll be hot, crowded, expensive, the kids will get antsy – here's my advice: Go anyway. It's more than worth it. There's plenty to compensate for the wait, the crowds and the absence of the much-discussed death mask (which was included in a 1970s touring exhibition, but deemed too fragile to make the trip this time). Against the backdrop of a colourful street scene, Cairo ballet troupe joined with Cairo Orchestra for a performance of Zorba the Greek. Attended by Mrs Suzanne Mubarak and a host of senior government officials, the gala concert was staged to mark the opening of Damanhour's new opera house, located in the restored premises of the onetime Al-Nasr Winter Cinema. The audience also watched a documentary on the history and refurbishment of Damanhour's most famous cultural landmark. "It is really a great leap for the Delta city of Damanhour," said Minister of Culture Farouk Hosni. "The new venue will not only allow the citizens of this area access to new art forms but it will also help nurture the talents of the future." Hosni added that the project had the full support of President Hosni Mubarak, who has also given the go-ahead for two similar restoration projects in the Delta cities of Tanta and Mansoura. The Al-Nasr Winter Cinema was built in 1930 to house a theatre, cinema and library. 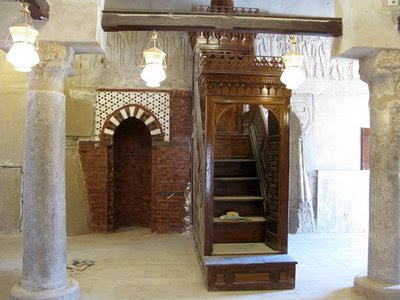 It is housed in a 1,500-square metre, three-storey structure decorated in a mixture of Andalusia and European styles. 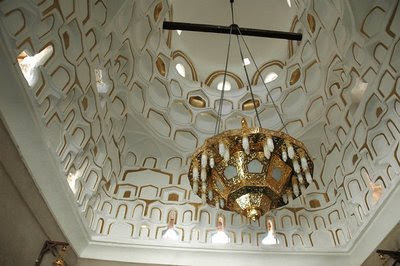 It has a moulded foliate ceiling and at its entrance is a large Ottoman style reception hall. The design of the main auditorium fuses elements from the Vienna State Opera and the Odeon Theatre in Paris and the edifice on Mahmoud El-Nokrashi Street quickly established itself as the city's leading venue, hosting many of the era's most celebrated performers. A look at the influence of oriental art and culture on western art and ideas, inspired by a new exhibition of modern art from the Middle East at the Saatchi gallery in London. Fresh from his travels in the Middle East, the transformation of the former ambassador to Iran left his fellow Britons astounded. It was not Sir Robert Shirley’s tales of his exploits in what was then Persia which intrigued and astonished his countrymen on his return, but his garb. Dressed head to toe in exotic Persian regalia, he stood out among his more conservatively dressed compatriots. A portrait by Anthony Van Dyck shows him attired in a lavish gold and silver embroidered tunic, heavily brocaded gold cloak depicting scenes of woodland and flowers and an enormous turban. For when Sir Robert was dispatched to Persia on his ambassadorial duties at the end of the 16th century, he embraced the country’s customs, apparel and artistic traditions so wholly, he enraged his own king, James I, for refusing to give them up once he was back on British soil. Sir Robert was not the first to indulge in orientalism, the movement by artists, writers and designers to depict or adopt eastern cultures. But what he does give us is a glimpse into a very British love affair with Middle Eastern art which thrives to this day. Scroll forward 400 years and the exhibition that has caused a recent stir in the western art world is Unveiled: New Art from the Middle East in the newly-reopened Saatchi gallery in London. . . . .
Matthew Girling, the chief executive of Bonhams, said: “The British have long been fascinated by the Orient and the Middle East and included elements of it into their designs. “The travel operator Thomas Cook started doing tours to the Middle East in the 19th century, people were being exposed to Egyptology and there were archaeological excavations which were brought back to Europe and met with huge enthusiasm. Video walk through of the new Lost Egypt Exhibition installation at COSI.